Negotiations with the main transnational conglomerates in the sector,including Nestlé and Coca-Cola, are "striding forward." December 30, 2016, 1:24 p.m.
Health life and family, bringing news to you !!! Negotiations with the main transnational conglomerates in the sector, including Nestlé and Coca-Cola, are "striding forward." Representatives of these companies have held reserved meetings with authorities of the current government, Michel Temer, in order to formulate procedures necessary for the exploitation by private companies of water sources, mainly in the Guarani Aquifer, in concession contracts for more than 100 years. The first public conversation about this and other sectors that tended to follow for the private initiative was scheduled on the 25th, the same day that the process of voting for the impeachment of President Dilma Rousseff was opened. This coincidence was fatal to the adjournment of the meeting. The announcement should contain a list of more "immediate" concessions, such as concessions for the airports of Porto Alegre (RS), Florianópolis (SC), Salvador (BA) and Fortaleza (CE) and the passenger terminals of the ports of Fortaleza and Recife (PE). In addition, there must be another list of projects to be granted or privatized in the medium term, with auctions that may occur within a year, such as Eletrobras' power distributors and freshwater sources. The relevance of one of the world's largest freshwater springs is so great that for decades it has been the target of speculation as to its use and exploitation. 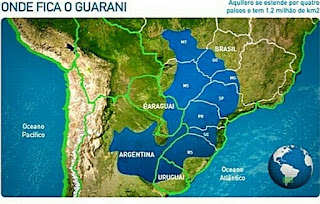 The Environmental Protection and Sustainable Development Project of the Guarani Aquifer System, known as the ANA Guarani Aquifer Project (SAG), was created with the purpose of supporting Argentina, Brazil, Paraguay and Uruguay in the elaboration and implementation of a legal and technical framework of Management and preservation of the Guarani Aquifer for present and future generations. After the victory of the conservatives in Argentina and the coups d'état on the advice of the ultra-right, both in Paraguay and Brazil, Uruguay remained to vote against the privatization of the aquifer. 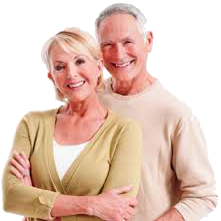 This project was implemented with resources from the Global Environment Facility (GEF), with the World Bank being the implementing agency and the Organization of American States (OAS) the international executing agency. GEF, however, has ties very close to large corporations. With a total area of ​​1.2 million km², two-thirds of the reserve are in Brazilian territory, in the subsoil of the States of Goiás, Mato Grosso do Sul, Minas Gerais, São Paulo, Paraná, Santa Catarina and Rio Grande do Sul. " Aquifer's strategic importance in supplying future generations arouses the attention of groups from different sectors throughout the world, "says document of the Human Rights Organization Land Rights. "Organized civil society is alert to possible privatization strategies of transnational economic groups. Since 2003, the Organization of American States (OAS) and the World Bank, through the Global Environment Facility (GEF), have implemented the Environmental Protection and Sustainable Development project to gather and develop research on the Guarani Aquifer , With the objective of implementing a common institutional, legal and technical model for MERCOSUR countries, "he adds. This drought’s effects on Brazil will be complex. And the effectiveness of the country’s water management will deeply impact its energy, agricultural and industrial sectors, as well as its growing population. 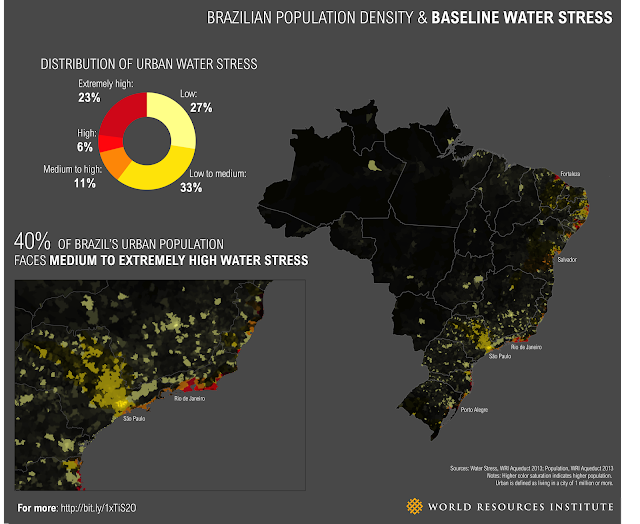 São Paulo’s ongoing emergency offers an extreme example of how dangerous a supply change can be, even in an environment with low-to-medium water stress in normal years. In response, experts from NGOs—including WRI—formed an “Alliance for Water,” which proposed hundreds of short- and long-term measures to adapt to the current crisis and prevent future emergencies. WRI is also working with IUCN, the Atlantic Rainforest Restoration Pact (PACTO), government representatives, and civil society leaders on building landscape restoration strategies to help re-establish environmental services where they are needed most, like the Sao Paulo watersheds. But as the drought’s impacts continue to ripple throughout the country, it’s clear that more work is needed. Decision-makers across the country must learn from the lessons of this drought and increase water-use efficiency, enhance water-storage capacity, and halt deforestation in the Amazon. Barlow speaking in defense of the Guarani Aquifer, November 2011. Blue Planet Project founder Maude Barlow says, "Water hunter Peter Brabeck of Nestle wants to control the Guarani Aquifer in Brazil!" Reuters reports, "On Tuesday [September 20]. Brazil launched a multibillion-dollar plan to auction off oil, power rights and infrastructure concessions. The government will sell operating licenses for airports in the cities of Porto Alegre, Salvador, Florianopolis and Fortaleza by the first quarter of 2017. It also plans to sell rights to operate federal roads in the center-west and south regions later next year. Center-right President Michel Temer has vowed to shift economic policy away from the interventionist policies of his predecessor, Dilma Rousseff." The Correio do Brasil adds (in Portuguese) that this "privatizing wrath" could extend to the Guarani Aquifer. 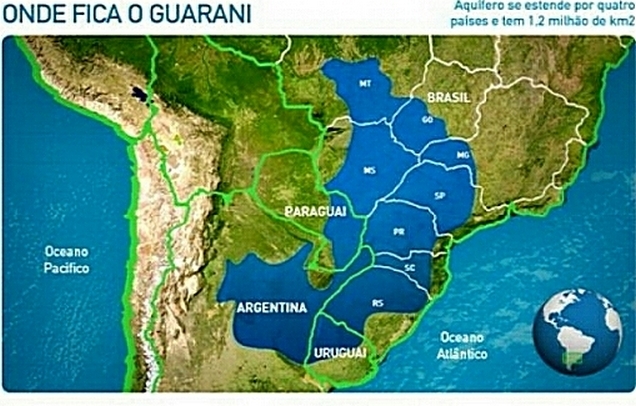 According to the newspaper, a senior official at the National Water Agency (ANA) has revealed that the Guarani aquifer will appear on the list of public goods to be privatized. The aquifer, located beneath the surface of Argentina, Brazil, Paraguay and Uruguay, is one of the world's largest aquifer systems and is an important source of fresh water. The Correio do Brasil article highlights, "Representatives of [Nestle and Coca-Cola] have held meetings with government authorities to formulate procedures for exploitation by private companies of water sources, especially in the Guarani Aquifer, in concession contracts for over 100 years - [the senior official] added." In November 2011, Barlow spoke in defence of the Guarani Aquifer at a conference in Florianapolis, Brazil. Her speech noted various threats to water then highlighted, "So this leads me to my biggest concern and that is the potential for the Guarani to become controlled by private interests. Already, corporations have preferential access to these waters. ...You are sitting atop a vast reserve of water in a very thirsty world, a reserve that is not only vital to the health and future of this region but to all of humanity. It is a treasure that must be protected by governments on behalf of the people and the ecosystems of the region." In June 2014, Barlow wrote, "Brazil is known as a water-wealthy country. But what I discovered from various previous trips there is that the country is polluting, diverting and exporting its water heritage (as 'virtual' water in commodity exports such as biofuels, rice and beef) to such an extent that it is now entering a crisis of water in spite of its water abundance. As well, the massive cutting of the Amazon is dramatically affecting rainfall. Major parts of Brazil are experiencing severe drought unprecedented in living memory. And the vast waters of the Guarani Aquifer are in danger from over-extraction, pollution and corporate plunder." And in March 2015, Barlow was on CBC Radio's The Current talking about the water crisis in Brazil. She noted, "My deep belief is that we are not looking at the big picture when we create economic and development policy. Almost every government in the world bases all their policies on the growth imperative. Unlimited growth, more stuff, more trade, less regulation, more power to the corporations. It's no coincidence that it's good for certain wealthy groups that can buy their way out of this crisis. This system is destroying water. We do not have the right kind of thinking in most capitals." In her book Blue Future: Protecting Water for People and the Planet Forever, Barlow highlights Brazil's support for the United Nations resolution on the right to water and sanitation (page 31) and its non-participation in bilateral investment treaties (page 230), but also notes its fast-tracking of approvals for water use for mining and other unsustainable water intensive practices (page 260), the use of water for the production of biofuels (page 177-79), the impact of virtual water exports (page 168), and the growing threat of desertification there (page 16). The World Water Forum, which is convened by big business lobby organizations like the Global Water Partnership, the World Bank, and the leading for-profit water corporations on the planet to discuss how transnationals can benefit from selling water to markets around the world, will take place in Brazil in March-April 2018. The Council of Canadians has just launched a boycott campaign to stop Nestle profiting from water, more on that here. For God´s sake do not let Michel Temer privatize our water resources. We already have great shortages in many Brazilian states and the meteorologic forecast is increased temperatures and droughts world-wide. Furthermore,the TISA free trade agreement has a hidden ´ratchet´codicil which will NEVER allow ANY agreement to be reversed. If Brazil has signed or about to sign the TPP or TISA ´trade agreement´ the ´ratchet´ clause will prevent Brazil from EVER returning the water reservoir to public ownership. 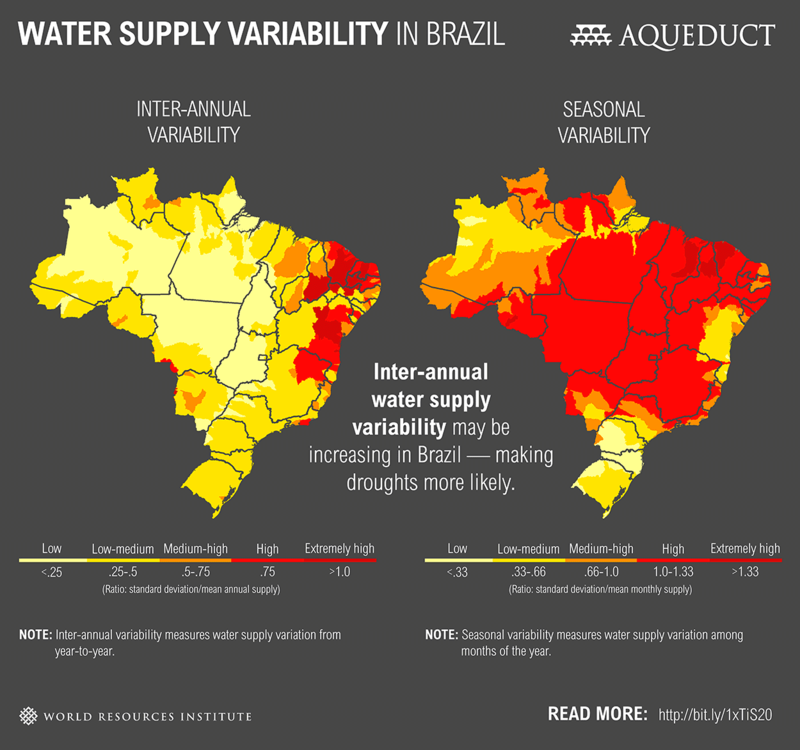 This is VERY serious, considering Brazil already have drought situations as well as the future predicted world water shortage. The global conglomerates, or the ´global elite´, are buying up natural reserves from countries around the world in financial difficulties, at well below market prices, seizing opportunities from countries in need. This is a typical way the ´global elite´ enhances their wealth at others expense. There are thousands of companies and private persons using water from this area,which, after Temer sign over the water rights,will be illegal without the permission from Néstle or Coca Cola, which allows the owners to sue Brazil for millions of dollars,depending upon THEIR estimated loss of business revenue. They have done this same trick with dozens of countries already. Temer has for many years acted as a Brazilian informant for the Obama regime. Fearing changes in the new Trump government,he is now in a hurry to strike a deal which can not later be reversed. The 23 TiSA parties currently comprise: Australia, Canada, Chile, Chinese Taipei, Colombia, Costa Rica, European Union (representing its 28 Member States), Hong Kong, Iceland, Israel, Japan, Liechtenstein, Mexico, New Zealand, Norway, Pakistan, Panama, Paraguay, Peru, Republic of Korea, Switzerland,, Turkey and the United States. the possible future agreement would for the time being fall short of the participation of some of the leading emerging economies, notably Brazil, China, India and the ASEAN countries. It is not desirable that all those countries would reap the benefits of the possible future agreement without in turn having to contribute to it and to be bound by its rules.